Birding Corvo 2009: Ring-billed Gull! As decided yesterday most of us kicked around the village today. Not much was found but I finally saw the Turtle Dove and the others saw two Yellow-billed Cuckoos that are still around. 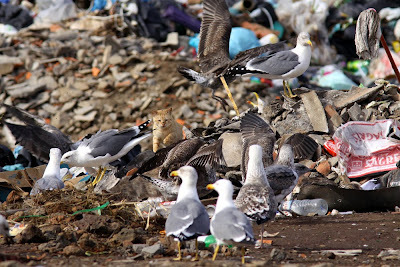 Saw the rubbish car driving around picking up trash so I went up to the rubbish dump and waited for the car to dump the trash (which attracts the gulls). Found two Great Black-backed Gulls but nothing else among the 100 or so gulls that came in to eat. 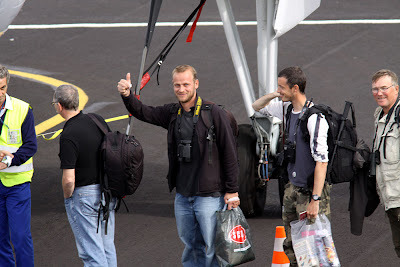 Spent some time around the airport since eight of the remaining 13 birders were leaving. Now we are only five left on The Rock! A man approached me and asked if I was Olof Jönsson. He said he was reading my blog on a regular basis and that a lot of people in Corvo and the Azores was following it. He had gotten the address from the authorities he said! A big suprise for me and very funny to hear of course. Ingvar, Fred, Vincent and Keijo about to board the plane. After the others left me, Bosse and David continued our birding around the village. After doing the shore and some fields for a few more hours I decided to go seawatching. 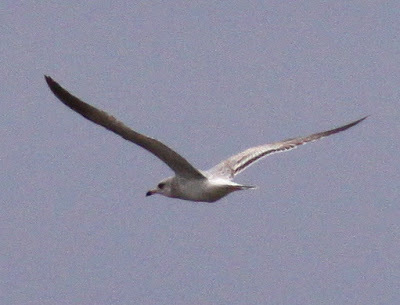 On my way down I saw a small flock of gulls over the airfield and among them a small one - Ring-billed Gull! Managed to get a few record shots before the bird flew out to sea. Refound it soon in a flock of a few thousand Cory's feeding about 2 km out from the harbour. Not the best views as you can understand, but a new Yank and actually the first Yank I find in several weeks - good for my stamina! Flores continues to produce and today they had Ruddy Duck, Pied-billed Grebe, Great Blue Heron, Laughing Gull and some other good stuff. See all observations on http://www.birdingazores.com/ We tried to get boat tickets to go there tomorrow but we failed since the boat was cancelled. Perhaps best that way since I think the weather is going to be pretty crappy tomorrow.